The news of Khaled al-Asaad’s murder shocked me to the core. This man was a scholar, absolutely devoted to the study of his beloved Palmyra. His torture and beheading at the hands of Daish (ISIL) for refusing to reveal the locations of valuable antiquities is the the most revolting and reprehensible of war crimes. 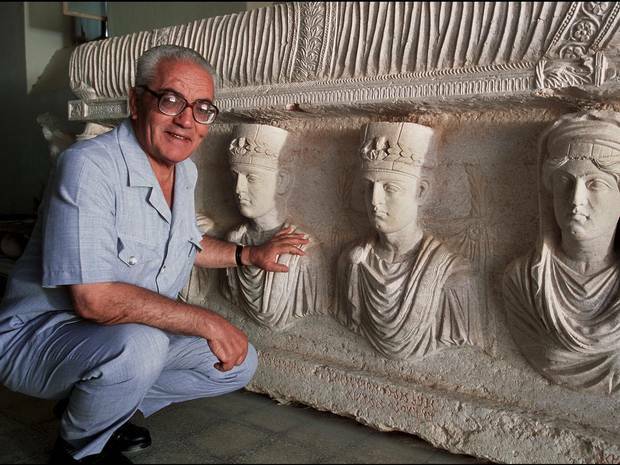 I did not know Mr. Asaad personally, but his unbridled enthusiasm and curiosity are shared by all archaeologists. I cannot even imagine what his family is going through, the horror of losing a loved one in such a way. I can only pray that in time, they will be proud of the sacrifice he made. This 82-year-old man protected his life’s work to his last breath. May we all stand so certain in our convictions in the face of barbarism. Catriona, you echo my own thoughts. You express our horror and the sense of loss to the world well, in addition to the great inspiration his sacrifice brings to all our own much less critical battles. I read this last night and just found out the temple in Palmyra has been blown up. These events are awful beyond belief. All those devastated by this are in my prayers. This made me very sad, and very proud of this human being who sent his family away, knowing he would be killed, and remained with his truth. May his inspiration be a light to us all.